Thought Leadership is one of the most valuable marketing tools available to today's entrepreneur. Not only is it highly affordable (largely free), it is also available to anyone with an opinion - and who doesn't have one of them? 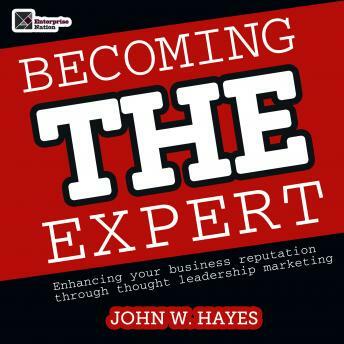 Becoming THE Expert explains how business owners, entrepreneurs, marketers and sales professionals can better position themselves as experts in their own particular industry and help to build brand awareness, generate leads and ultimately drive sales through the sharing of their detailed knowledge and insight. Written in plain English and using real world examples, the book explains how to find your voice and then plan, create and distribute Thought Leadership Marketing campaigns using a wide range of channels including blogs, white papers, videos, podcasts, webinars, PR, the media, books, eBooks, public speaking opportunities and social media. This book is for any business professional who values the idea of sharing knowledge, empowering the people they work with and building their reputation on the back of holding an open and honest dialogue with the communities they serve.